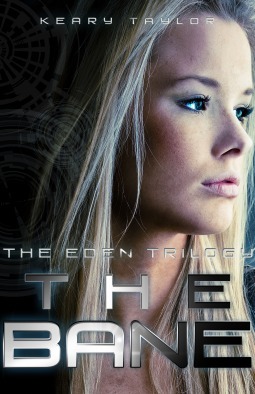 Previously published as Eden, due to reader demand it has been revamped and rereleased as The Bane: book one in The Eden Trilogy. I've only read one of Keary Taylor's other novels, What I Didn't Say (read my review here) but comparing The Bane to What I Didn't Say is like comparing apples and oranges. Both are YA novels, but completely different from each other. The Bane is a neat mix of sci-fi and dystopian fiction. I had a little bit of trouble figuring out the history of the Evolution, as Taylor does not reveal all the details right away, but I liked the mystery element to the story. And the premise of the world, the Bane and the humans, was very unique and quite terrifying. It took me a while to start liking Eve. I admired her from the beginning, but she's not a very endearing character. Side note: Are any female leads in YA dystopia in touch with their feelings? They don't really have time to get emotional---being so busy trying to survive day-to-day, you know? My one complaint about The Bane is that the story moved slowly for much of the book. Now that I'm a mother to a toddler, I really need my books to grab me in the first few pages or I lose interest quickly. It takes me so much longer to read a book than it used to, that it's easy for me to forget plot points in between reading sessions. So I think I would have enjoyed this book even more had it been a little shorter or if it had really taken off at the beginning. I loved the love triangle in The Bane. It was definitely a slow build, but I loved how Taylor resolved the conflict there. Overall, I really enjoyed this book and will definitely be reading the next book in the series. yeah i agree. i'm like you, i have to have 'connection' in the earlier pages or else, it would be DNF. Aw, sorry to hear that it moved slowly at first and it took a bit to understand the world, those are things that turn me off and make me not finish. Thanks for review though and glad to know there are other things that make it enjoyable.